We participated in the first speaking engagement of the season, today, with a vinegar presentation at the Women's Health event at Arrowwood, north of Alexandria. We showcased our new power point presentation created by Savannah and our new taller bottles. It was a beautiful setting and we made new friends among the class attendees. We hope they'll all come to visit. Through exposure for this event we have been invited to appear on Patti Wicken's radio show on KXRA 1490 AM. Listen for us on Apr. 23 at 9:05 a.m.
Next Saturday, Apr. 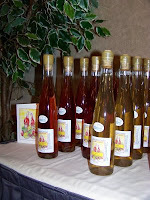 4, we'll be talking about vinegar and selling it at the West Ottertail County Horticultural Event in Underwood. We continue to use vinegar in new ways. 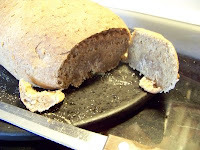 Last week I made vinegar bread using my triple wheat recipe and substituting 1/2 cup of vinegar for a portion of the water. The bread was heavy since the acid of th e vinegar may have inhibited some of the yeast action. It had a tangy flavor reminiscent of sour dough bread. Definitely a recipe to try again, perhaps with a little less vinegar. Another development: my foodie watercolors can now be found in a shop on Etsy. Search for the "leatherwood" shop or look under art and watercolors. We're looking forward to getting our local retail space spruced up and then getting the yard and garden in shape. I've ordered seeds from Pinetree Seeds and hope they come soon so I can get the tomatoes, peppers and a few other early vegetables started indoors.